The federal government, forty seven states, and the District of Columbia all require licenses for money transmitter businesses. The federal license is administered by FinCen, the Financial Crimes Enforcement Network of the United States Department of Treasury. A Money Transmitter falls within the federal definition of a Money Services Business (MSB). The states have not adopted a uniform definition of a Money Transmission so the definition may vary state to state. Any business performing money transmission is subject to money transmitter license requirements. See some examples below. In Connecticut, money transmission is defined as “engaging in the business of receiving money or monetary value for current or future transmission or the business of transmitting money or monetary value within the United States or to locations outside the United States by any and all means including, but not limited to, payment instrument, wire, facsimile or electronic transfer or issuing stored value.” See more at the Connecticut Department of Banking. In California, Money transmission “means any of the following: (1) Selling or issuing payment instruments. (2) Selling or issuing stored value. (3) Receiving money for transmission.” See more at the California Department of Business Oversight. In Maryland, money transmission means the “business of selling or issuing payment instruments or stored value devices, or receiving money or monetary value, for transmission to a location within or outside the United States by any means, including electronically or through the Internet.” See more at Maryland Office of the Commissioner of Financial Regulation. The state laws apply broadly to businesses that receive money for the purposes of transmitting it. As the internet has evolved as a marketplace, more and more businesses are finding that they are subject to money transmitter laws and licenses. According to the South Florida Business Journal, a mobile payment site was recently fined over $500,000 for operating as a payment processor in Florida without a money transmitter license. This case and others like it puts Internet payment sites on notice that they may need the license before to operate legally. Money Transmitter licenses often require surety bonds, financial statements, and minimum net worth requirements. State processing times can be lengthy and operating without a license will result in high fines and/or an order to cease operations. 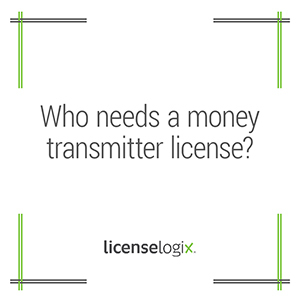 LicenseLogix can navigate the license requirements for Money Transmitters by helping you obtain all the licenses and registrations you need and managing your ongoing license renewals. For additional help you can fill in the form on the left or give us a call at (800) 292-0909.